Our walks start and finish at various locations on Fridays throughout the year. There is also a Long Walks Group about 5 to 7 miles long. Our Friday meetings often start at a pub. By arriving early we are usually able to use their facilities and book our lunch/snack if required with the publican. Around the halfway point on a walk we stop briefly for a 'banana' break. CANCELLATION OF A WALK OR CHANGE OF LOCATION Please check this webpage and your emails prior to setting out to join a walk. An email will be sent by 9.00 am, at the latest, on the day of a walk if, for some reason, the event is cancelled or altered. 'Guide for Leaders of Short Walks' see the Links panel on the right of the page. Walking Holiday in 2019 is 15th to 19th April at Malham, Yorkshire. More information is on the webpage for the Long Walks Groups, Liz can put you in touch with the organiser of the holiday. 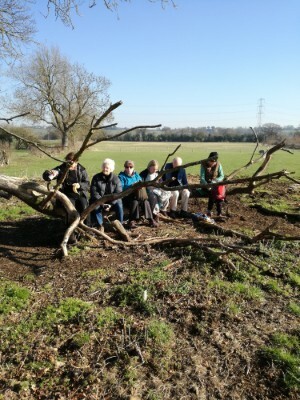 Walks are usually planned and led by the group members ensuring a wide variety of locations. Help in planning walks is always available and new walk leaders are encouraged. The group combines with the Long Walks Groups and holds an Annual Meeting in January each year. A nominal subscription of £1 pa is collected at the meeting to help pay for maps, paper, ink etc. If you would like to join the Short Walks group, first join the U3A, then email your U3A number and details to Liz Whitehouse. U3A policy is that dogs are not allowed on U3A walks. If you would like to join the Long Walks 2 Group then email Pete and Jacki Ager. We also organise an annual walking holiday, which is open to all group members and partners and is based in one of the hotels operated by HF Holidays. There are a selection of walks organised by group members available each day providing a choice of terrain and distance. Hotel bookings are full board and walks are organised by group members. Worcester U3A Walking Group is affiliated to HF Holidays and enjoys exclusive benefits and discounts. Walkers make their own way there and numbers are usually such that we have exclusive use of the hotel. Holidays are popular and usually fill up at the Annual Meeting. Notes: No stiles and level terrain. To access the site from the South proceed to the island which meets Newtown Road (B4636)and go round it and double back along the dual carriageway. Notes: It is just over 4 miles, all on the flat with no stiles. It follows the river Avon.